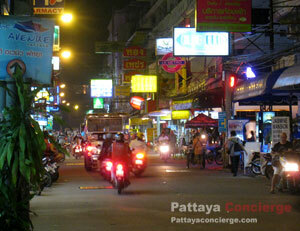 Soi Buakhao is one of most famous streets in the center of the city of Pattaya. This could also be seen as a major road. A reason to make this road so popular is that the road from Soi Buakhao is an alternative street that connects between Central Pattaya Road and South Pattaya Road, where the street is also two-ways unlike the second and the beach roads which are one-way. Another reason is that Soi Buakhao is recently seen as a new Walking Street since it is able to offer almost everything to visitors such as a wide range of accommodations, a variety of shops, all kind of beer bars and night clubs, car or motorbike rental shops, massage parlors, pharmacies, convenient stores, internet cafes, and so on. Because this street is just one large block from Central Pattaya to South Pattaya, it is able to walk from one place to another, butit is a little far if you walk from the start to the end of this Soi. However, the road of Soi Buakhao is not a large one, so it is a little traffic jam for the road being used for 2-ways directions, especially a little after working time 17.00 - 18.00. Many visitors say that Soi Buakhao is still a secret street to enjoy nightlife. This is because although a plenty of bars and night clubs are located in Soi Buakhao, there is not much information of this street provided. 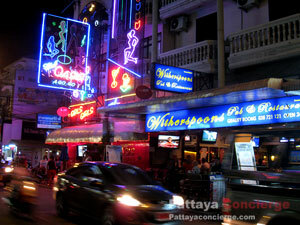 Just as Pattaya Walking Street, you can find almost every sort of night places in Soi Buakhao - go go clubs, gay clubs, beer bars, and restaurants. Most of bars are open-air bars so that the bars will be noticeably attractive towards visitors passing across. Additionally, prices are usually more valuable for you to spend on, and some people also say that staffs and hostesses from night places in Soi Buakhao are friendlier than many other places in this city. Some of well known places in Soi Buakhao are The Butcher's Arms Pub, club blu, Rabbi's Elephant Bar, Rich Bar, Save the Golly Bar, Sugar Sugar, Liquid Lounge, and Nicky's Bar & Restaurant. However, this street will not be crowded as the Walking Street, so it would not be suitable for those who are after crowded-street atmosphere.